What I love most is the simplicity and clean look. I’ve been studying a lot lately and keep charts up on the iPad while I’m reading about a chart. It’s easy to see everything that’s being discussed. Not over-cluttered, yet very flexible. Mr. Jobs would have been pleased with the sleek look and solid functionality. This App is awesome. It’s aesthetically beautiful and very clear in the display on information. Great for professionals and lay people. So worth it!! I use this app on a daily basis. And I’m 99% happy with it, especially the charting capability. This is not some full-fledged astrological software app. 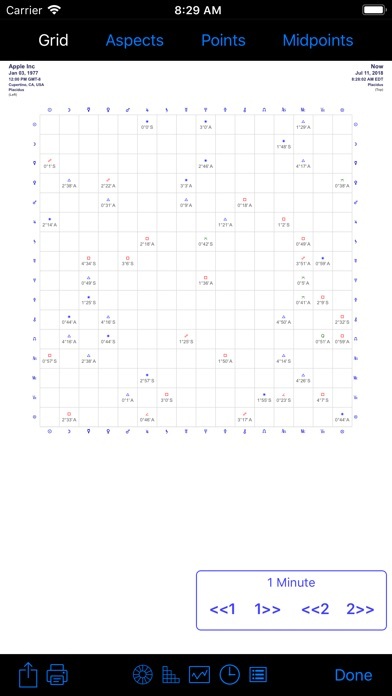 It’s basic but does the job of generating charts snd providing an ephemeris. The auto time zone feature is WiFi based, so if you try to load the time zone when there’s no service, you’ll get stuck waiting for the app to finish searching. I’ve set my time zone as the default, but the UTC offset doesn’t show, and for me it’s reassuring to see it to confirm that the chart is accurate, so the Find Timezone feature is useful. Chart selection can get tricky if your moving around a lot and opening and closing charts. Charts stay selected, so you’ll have to hunt down the selected chart(s) and deselect it before opening a different chart. I’d rather not lose the feature of the persistent chart selection because it is useful, but a ‘Clear Selected Chart’ button would be helpful. Highly recommend this app for the mobile astrologer. I can’t say enough good things about this app. It is a truly professional tool in the palm of your hand. The elegant design combined with ease of use makes it my go to daily astrology software. I use it to cast and store all of my charts. It is so great to be able to have all that information with me wherever I go. Being able to meet someone, create a chart for them and then send them an email or text of that chart in moments is so amazing! 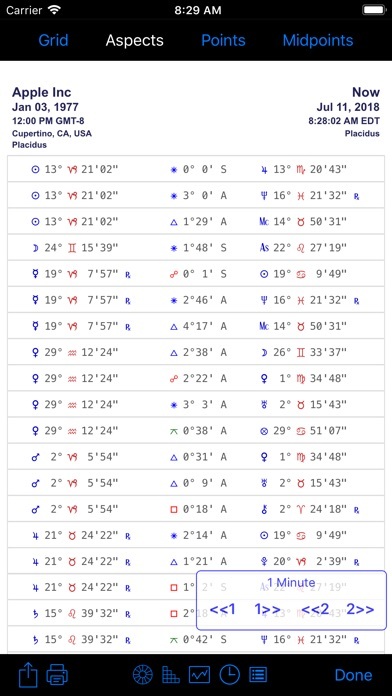 The ephemeris lookup tool is so useful, and the sky now feature with the ability to easily move that or any chart backwards or forwards by weeks or minutes is an invaluable means of really seeing the ebb and flow of transits. Bravo! I hope this developer stays at it for a long, long time. I would be so sad to find the day when this app is no longer supported, and would in fact keep a dedicated older device just to keep using it if that day ever came. Please buy this app, and support this dev!!! You will love it!!!! This is a useful app, but can someone confirm if there’s a discount on add-ons that contain features you already have, such as on the extended ephemeris if you’ve previously purchased the extra asteroids? Also, it would be extremely helpful to have the option to emphasize the angles (thicker lines for the horizon and meridian). Love this app! Especially love ability to see 3 charts overlaid and go forward/back in time. Also love the Moon void of course. Of course, basic interpretations would be nice but probably more expensive. Definitely worth the price. Great app for calculating charts, ephemeris, comparisons, etc. Basically anything you need to do you can. Very easy to read, excellent options (if a bit daunting at first). However, it would be good if one could see whether aspects are applying or separating (yes, you can figure it out, but a mark, like an a or s next to the degree is helpful), and it would also be good if the app did not demand reviews on such a frequent basis. Problem since your recent update. Great program, except with the recent update I crash every time I try to get the time zone updated for a new location for aimed solar return charts. This means one is unable to create charts. The sooner you can fix this the better. Before this update everything was great. Now I’m just waiting for the program to be fixed. Love this app, have used it for years. But would like the functionality of being able to input lat/long coordinates by hand instead of relying only on map function. The map itself is buggy and is often useless when the client is born in a very small or rural place. Otherwise, thanks to the developer for an awesome, useful and indispensable app! Documentation fails to explain bizarre output like the fact that you can’t get exact aspects timing on any of the calendars, only the timing as per the orb. So for example say you want to see when the Full Moon will occur, you’ll only see when the Moon is opposite the Sun within the set orb - not exact. Pretty display but poor interface that doesn’t match the basics of chart examination. Would be great if the app synced between devices and allowed for more customization. I would love to see the hours incorporated into the app as well. But, all in all, love the ephemeris and use it frequently. Super easy to use and navigate. Like that you can progress charts so easily, multiple house systems. Visually very good. The only thing that I haven't figured out is if there is a way to take away some of the aspect lines on charts. 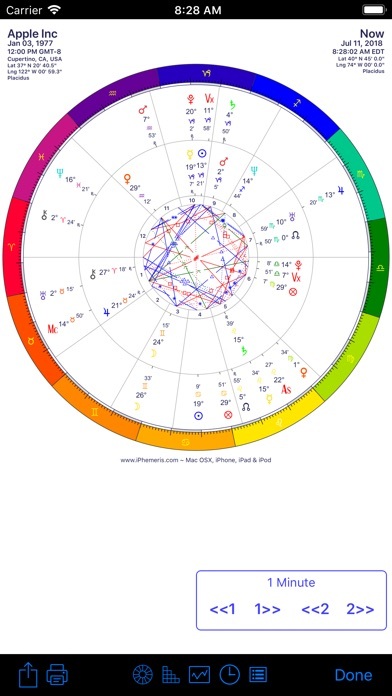 The charts can look cluttered when you're looking at transits and progressions. Even though I have a full-featured astrology program on a laptop, I think iPhemeris is more convenient to use. I can make, retrieve and compare charts easily, and I love the tri-wheel layout (in-app purchase). iPhemeris has lots of possibilities for customizations. I've downloaded and deleted other substandard astrology apps, but this one is a keeper. 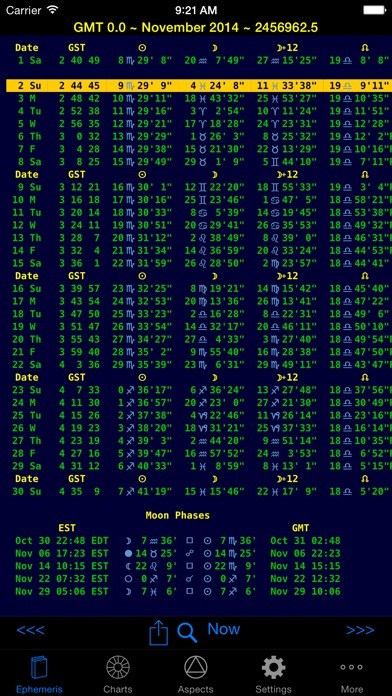 I like having a pocket ephemeris on my phone to whip out and pull up a chart when I need one. I’m an astrologer and this app hasn’t failed me yet! Thanks for keeping it up!! excellent app, hoping for one small update! 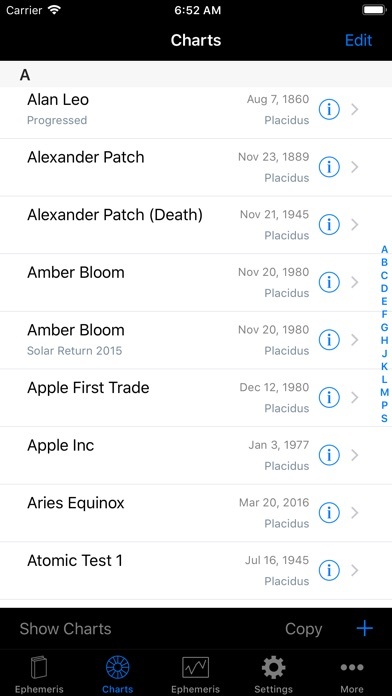 this app is perfect for daily astrology reference and chart-reading! I’ve been using it for a few years and the ability to advance and rewind transits overlaid the chart (and overlaid synastry!) has deepened my understanding of the motion of the planets over time. My one wish would be for the “Sky Now” and chart view screens to have the option to also display the sidereal zodiac as an outer rim to the tropical zodiac for quick comparison across systems. As it is I can do the mental calculations well enough on the fly, but the usefulness of the app is one of its strongest suits and I think that addition would broaden its usefulness to a wider body of astrologers. Excellent app, 5/5 regardless. Great app! Use it very often! I really wish it were possible to download a stripped down version for those of us still using older devices with small hard drives. It takes up over 600mb on mine, which is a lot on my phone. I just use it for the ephemeris and running an occasional chart. Still a fantastic app, though. Very accurate for a small, convenient astrology application for IOS. Good to create and store charts on the fly. Plus, it provides good storage for often used charts. Gives a good range of chart and house systems, and aspect choices. The transit and progression features are easily mastered. Both are usually only found in robust, not mobile applications. The ephemeris is presented in a visually comfortable way. Parallels of declination and moon void of course are very useful for me. I would like to see moon’s applying aspects added for horary use. I would pay extra for this feature. I give this app five stars keep up the excellent work. The iOS Sky Now is my favorite tool on this app. detailed customization, all the functions I need and more, visually appealing, clear and easy to follow, instant message support right in the app... this has it all, well worth the price, I use it every day and couldn't imagine being without it!!! I use it constantly and it is functional and powerful. The developer is also responsive and great about questions. The only thing on my wish list for the app would be the ability to do planetary returns in addition to solar and lunar returns. I can get there eventually by playing with the wheel but I would find it useful to look at chart ruler returns! This is a great app! Never crashed, no problems. It's accurate, as I checked it up against my computer software(solarfire w/ Swiss ephemeris). Really excellent software for an excellent price. I use it at least once a day, if not more. Great for the professional astrologer. Also appreciate that each new major update includes another significant feature. Would like to see some written report capabilities for clients - they really enjoy having those available. Some friends of mine in the astrological community have been urging me to get this app - I am fairly anti-technology and keep handwritten lists of everyone's chart in a notebook. I finally decided to get it, mainly so I could have an easy way to track transiting planets. Now that I have it I'm such a big fan. IPhemeris is very thorough, multifaceted, easy to use and I love how customizable it is. What a blessing to have all this information so neatly compiled and readily available. I recommend it 100% to any student of astrology. For me, this is the app to have. I have others, but this is the best, and my go-to app for astrology. The new features are great, and was happy to purchase, since I believe developers should be rewarded for their good work. I am happy to support the developer and also purchased the Mac version, which is another great app. Functional, accurate calculations, with useful features. Highly appreciate this app as a reference (ephemeris) as well a useful tool to cross reference transits with a chart. Surprisingly well designed compared to other much less effective apps I've also purchased. Thank you to the designers. Updating my review to again state that how useful this app is, and to express surprise that not more users are reviewing. This is one of the few apps I use that operates as both a reference (the ephemeris), and a functional tool to quickly view transits and their aspects in a birth or event chart. Highly rate this app!!! I am just getting started with the program and am very impressed. Being able to watch the chart change by increments of a minute, ten minutes, an hour, etc. Is just what I was looking for. I am very grateful. Thanks! Just one puzzling thing so far: For some reason it doesn't seem to get the placement of Eris correct. In the first chart I did, it placed it in Libra in 1964, when astrodienst and other software I use places it in Aries. Edit: Thanks for your quick response. OK, I see I was looking at the wrong symbol. What is the symbol that looks like an upside down Venus? This is a great app. When I see "in app purchases," I usually don't buy the app. This one I bought before there were in app purchases, and it's super useful without the additions. Massive data. Love it UI too. I'd love to compare the composite chart to each in the relationship individually. Maybe someday. Anyway, 5 stars. I've downloaded so many astrology apps looking for the most user friendly software that is packed with features. This is the best app for quick looks at the current chart (sky now) and your personal transit calendar. Hey, if you're into astrology, I'd bet you'd like this app. It is just as powerful as the desktop programs and portable for on the go reference of transits, progressions, etc. All in all an excellent app worthy of purchase for the those of us who desire a portable version of in-depth chart analysis. I love having all this info at my finger tips. Personally, I think there are many wonderful features of this helpful app, I love it! It makes everything so easy and right at one's fingertips: making charts, checking aspects, progressions in an instant, exact ephemeris, comparing charts, comparing your chart with the "now", and your progressed chart, and many other nifty features for the beginner or pro ( I'm neither ). Astrological books ( in large part ) are anachronisms. Would be so awesome if you could have some kind of resource or chart within the app to understand the glyphs. There is an asteroid currently at 19 degrees in Virgo, and I have searched Google in every possible way to find out what it is with no luck. And it's not like I can just key the glyph on a keyboard. Seriously, Google asteroid glyphs and try to find it. You won't. All the other glyphs are easy to find and understand, just not that one. Please don't assume everyone who enjoys your app is a professional astrologer, some are merely astrology enthusiast. Otherwise this is really an awesome app. This is a great app. I use it all the time. I’m have several charts set up (all the people i am close to) and I refer to it often in my astrology studies. I use this app everyday to check some event correlation or relationship connection. I’m not an astrologer but feel like one with all the layers ... aspects, midpoints, and ephemera, available with this app. Love it! An ephemeris is a life tool that everyone can benefit from. Understanding where the planets are, now and then, can help one to know oneself and others better. This app is much more convenient to carry around then the several volumes it replaces. It’s other functions are so great there isn’t enough room on this review to sing all its praises. As a professional astrologer, I love this App. Having the ability to do a chart on my iPad in minutes, including progressions, is fabulous. Thanks! Pretty good app for the price, comes in handy. A well-curated set of features that makes it easy to use on the go. An affordable alternative to expensive desktop apps cluttered with research tools used less often. I use both phone and tablet, and it's so convenient for sending charts to the printer using wifi. Just the ability to have an emphemeris at my fingertips is amazing, but this program/app has so much more that enhances user interface.